Cherish This Christmas – Giveaway! So, we all get that I like Christmas books, right? It should seem fairly obvious by now. But in my overwhelming realm of Christmas novels, I had to sneak in this newbie that I discovered thanks to my friend and fellow blogger, Diane Estrella. Did I mention there is a great giveaway involved? Just keep reading. Do these words fill you with joyful anticipation…or dread at the thought of approaching chaos and clutter? 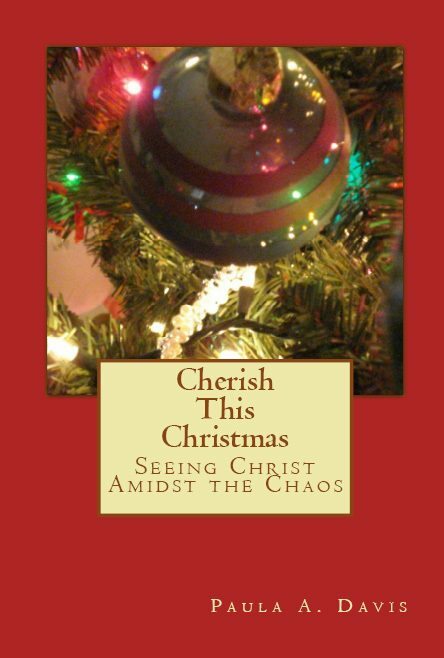 This year let’s cut through the chaos and choose to…Cherish This Christmas! This collection of daily devotions will take you back to the days of Jesus’ birth and help bring more meaning to the chaotic days of December. Through scriptural insight and personal reflection, Paula will help you to Cherish This Christmas. You can purchase the book here at Amazon, the Kindle edition here, or at Paula’s CreateSpace store. I have to say, I found myself stopping at the end of the entries and praying. They really do make you stop and think for a moment. No, don’t worry! There is no condemnation of holiday fervor. I could never love a book that wouldn’t support the love of baking. But it does encourage you to make sure your mindset is right as you go about frosting those cookies! To jubilate the release of her debut book, Paula is celebrating and you’re invited to join along with her giveaway! Enter today by heading over to Paula’s blog and jumping on the Rafflecopter. But hurry, the giveaway ends on December 15th. Winner will be announced at Paula’s website, December 16, 2012. Paula Davis’ writing encourages her readers to apply God’s Word to everyday life. When years of searching for “Mr. Right” left her heart empty, she turned to God for comfort and found so much more. Paula now knows firsthand that completeness and contentment is only found when her eyes are focused on Jesus. She wants others to know this truth as well. Paula loves to share with others what she’s learning about the depth of God’s Love. At Christmas time, you’ll find her in Central New York reading, baking or cuddling her little dog, Lucy, while sipping a good cup of coffee. You can follow her blog at www.pauladavispeace.com.